The XAML framework includes several controls for entering and editing text, and a set of properties for formatting the text. The text-entry controls are TextBox,PasswordBox, and RichEditBox. This quickstart shows you how you can use these text controls to display, enter, and edit text. The XAML framework includes 3 core text-entry controls: TextBox, PasswordBox, and RichEditBox. The text control that you use depends on your scenario. Here are some scenarios and the recommended control. Enter or edit plain text, such as in a form. Edit a document, article, or blog that requires formatting, paragraphs, hyperlinks, or inline images. You can use a TextBox control to enter and edit unformatted text. You can use the Text property to get and set the text in a TextBox. Here's the XAML for a simple TextBox with it's Text property set. Here's the TextBox that results from this XAML. You can make a TextBox read-only by setting the IsReadOnly property to true. To make the text in a multi-line TextBox wrap, set the TextWrapping property to Wrap and the AcceptsReturn property to true. 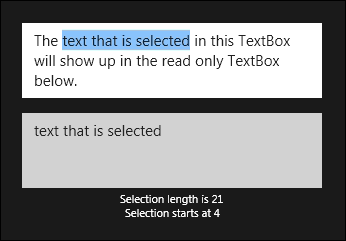 You can get or set the selected text in a TextBox using the SelectedText property. Use the SelectionChanged event to do something when the user selects or de-selects text. Here, we have an example of these properties and methods in use. When you select text in the first TextBox, the selected text is displayed in the second TextBox, which is read-only. The values of the SelectionLength and SelectionStart properties are shown in two TextBlocks. This is done using the SelectionChanged event. Here's the result of this code. You can enter a single line of non-wrapping content in a PasswordBox control. The user cannot view the entered text; only password characters that represents the text are displayed. You can specify this password character by using the PasswordChar property, and you can specify the maximum number of characters that the user can enter by setting the MaxLength property. You get the text that the user entered from the Password property, typically in the handler for the PasswordChanged event. Here's the XAML for a password box control that demonstrates the default look of the PasswordBox. When the user enters a password, it is checked to see if it is the literal value, "Password". If it is, we display a message to the user. statusText.Text = "'Password' is not allowed as a password." Here's the result when this code runs and the user enters "Password". In Windows Store apps, the PasswordBox has a built-in button that the user can touch or click to display the password text. Here's the result of the user's action. When the user releases it, the password is automatically hidden again. 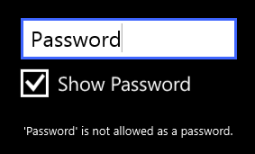 In Windows Phone Store apps, the PasswordBox has a built-in checkbox below it that the user can check to display the password text. You can use a RichEditBox control to enter and edit rich text documents that contain formatted text, hyperlinks, and images. You can make a RichEditBox read-only by setting its IsReadOnly property to true. By default, the RichEditBox supports spell checking. To disable the spell checker, set the IsSpellCheckEnabled property to false. For more info, see Guidelines and checklist for spell checking. You use the Document property of the RichEditBox to get its content. The content of a RichEditBox is a Windows.UI.Text.ITextDocument object, unlike the RichTextBlock control, which uses Windows.UI.Xaml.Documents.Block objects as its content. The ITextDocument interface provides a way to load and save the document to a stream, retrieve text ranges, get the active selection, undo and redo changes, set default formatting attributes, and so on. This example shows how to load and save a Rich Text Format (rtf) file in a RichEditBox. // Open a text file. // Load the file into the Document property of the RichEditBox. // other app can update the remote version of the file. The touch keyboard can be used for text entry when your app runs on a device with a touch screen. The touch keyboard is invoked when the user taps on an editable input field, such as a TextBox or PasswordBox, and is dismissed when the input field loses focus. The touch keyboard uses accessibility info to determine when it is invoked and dismissed. The text controls provided in the XAML framework have the automation properties built in. If you create your own custom text controls, you must implement TextPattern to use the touch keyboard. You learned how to create TextBox, PasswordBox, and RichEditBox controls to display and edit text in your app. For more code examples that show these controls, see the XAML text editing sample.